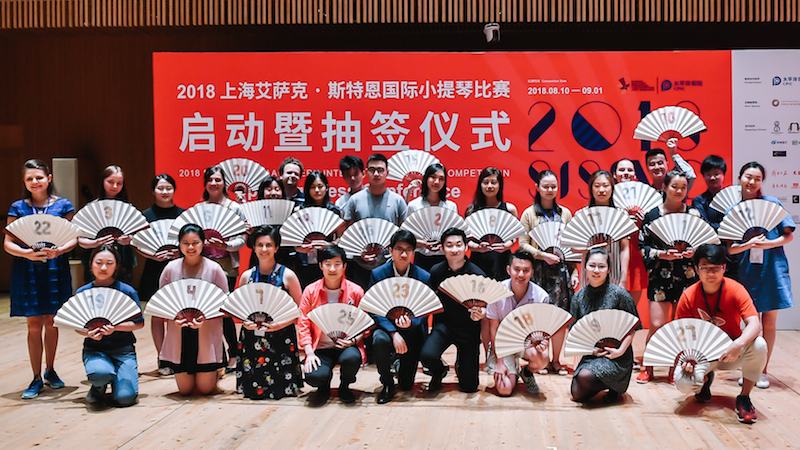 August 12, 2018, 1:58 PM · The second-ever Shanghai Isaac Stern International Violin Competition began last week in China, with 27 violinists ages 16-32 from 11 countries and regions competing for a top prize of $100,000, which will be awarded Sept. 1. Quarter-finalists in the Shanghai Isaac Stern International VIolin Competition include 27 violinists from 11 countries and regions. I also learned more about why Stern's legacy was so important to those in Shanghai, both from Weiling and also from these young violinists from all over the world (click here to see all names) as well as a jury well-known leaders the the field (see below), all in Shanghai's modern symphony hall that opened in 2014, is a sign of progress to those who want to see this music thrive all over the world. Six finalists will be announced Aug. 24, after semi-final rounds Aug. 18-20 during which participants will perform a Haydn quartet movement with the Shanghai Quartet; a sonata and a Fritz Kreisler piece; followed by a further semi-final round Aug. 23-24, during which they must each perform Mozart Concerto No. 5, with cadenzas they have written themselves. The final rounds, Aug. 30 through Sept. 1, require the performance of a work written by Chinese composer Qigang Chen, "La joie de la souffrance," as well as a major violin concerto (Tchaikovsky, Brahms, Mendelssohn, Beethoven, Glazunov, Prokofiev 1, Dvorak or Bernstein Serenade). Winners will be announced Sept. 1. The jury for the SISIVC 2018 is co-chaired by conductor David Stern, son of Isaac Stern, and Vera Tsu Weiling, who is professor of violin at both Shanghai and Beijing Conservatories. Other members of the jury include violinists Maxim Vengerov and Augustin Dumay; violin pedagogues Zakhar Bron, Dora Schwarzberg and Daniel Heifetz; leaders in China's violin scene Lina Yu and Siqing Lu; Shanghai Quartet violinist Weigang Li; Emerson Quartet violinist Philip Setzer; former NY Phil concertmaster Glenn Dicterow; Munich Philharmonic concertmaster Sreten Krstic; artist manager Martin Campbell-White and Philharmonie de Paris programming director Emmanuel Hondré. The competition includes a grand prize of $100,000. Second prize will be $50,000 and third prize $25,000, with a prize of $10,000 awarded for the best performance of the Chinese work, Qigang Chen’s "La joie de la souffrance." A $10,000 Isaac Stern Prize also will be awarded to an individual – in any field and from any part of the world – who is deemed to have made an outstanding contribution to the understanding of humanity through music. August 14, 2018 at 12:18 AM · I hope that days when a single individual can name his protege the “co-winner” of a major competition are behind us.